Discussion in 'Guitars in General' started by TheWayfarer84, Apr 13, 2016. Finally put together my end all, be all strat. I wanted something simple, utilitarian, and understated. 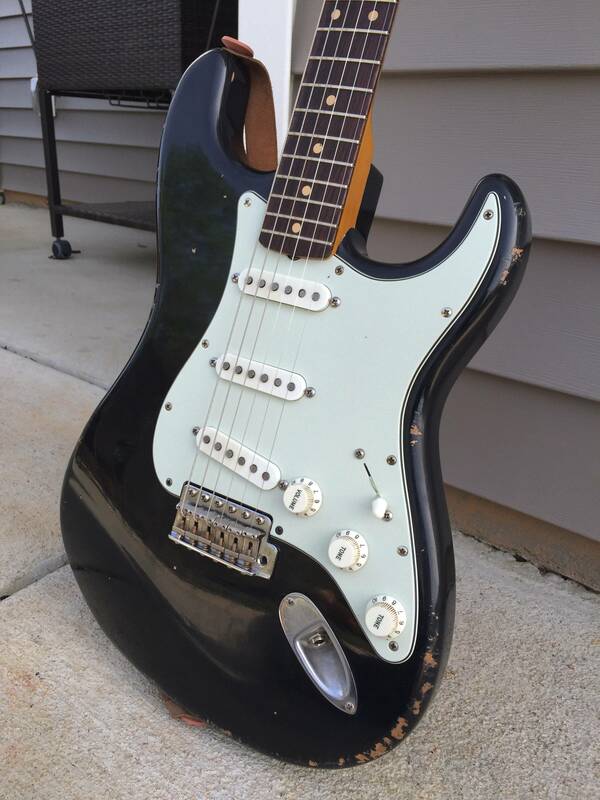 Nothing looks more like a workhorse than a black strat. This thing finally came together from a new body, and pieces I'd been collecting over the years. The guys at MJT were phenomenal at putting what I had in my head, into my hands. The first body was aged a little more than I wanted, and even though it was probably what I had asked for, they were kind enough to make another when I said I wasn't 100% in love with it. It has just enough chipping to look like it's been around, but still probably spent more time in a case than on stage. It's hard to pick up on camera, but the body has the most gorgeous checking running across the body. The Musikraft neck was finished by an unknown source. 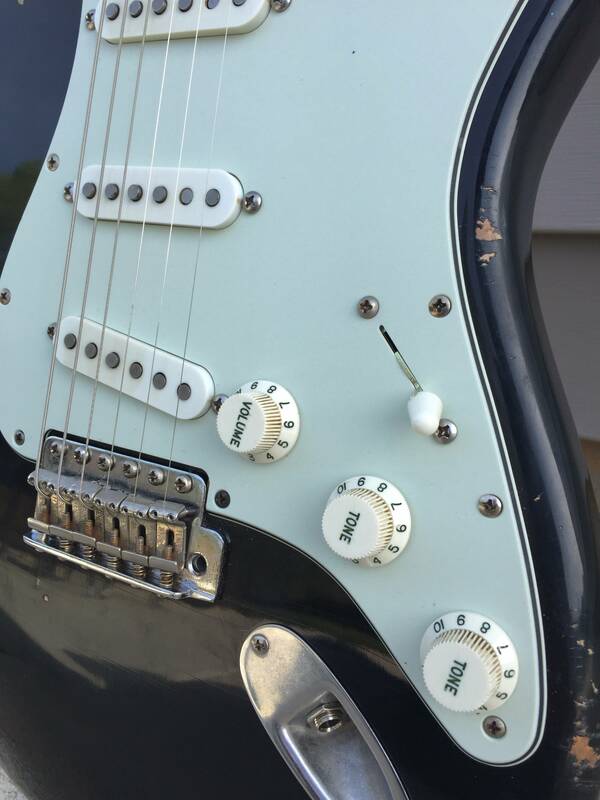 I lucked out on a really impulse buy on ebay and ended up with one of the greatest strat necks I've ever played. .84 @1st, 1.650" nut, 9.5 or 10" radius and medium jumbos, quartersawn and Veneer fretboard. On paper, it's nothing unique, but it just all works together. The back of the neck is smooth as glass, the rosewood is dark, and it just plays so easily. I stupidly sold this neck once, and I had to buy back a whole guitar to get it back in my possession. Worth it. I may swap decals to a '65 transition logo. The pickguard is a Lashing 100% celluloid. It is the lightest mint green I've ever seen. It makes a Fender guard look like lime green sherbet. The best part is it will age just like the originals. Since this is intended to be my long term keeper, I'll get to enjoy the process. I bought it when he was blowing them out at $100. Even that, it was a little frivolous, but oh well. Fatboy UK aged parchment pickup covers and knobs. Subtly aged, which is what I was going for. They're almost a little too close to the pickguard color, but as it ages, they will contrast more. Rumpelstiltskin CBS in the neck and middle, and Experience in the bridge. I forgot how good these pickups are. I've been running a set of his Pre-CBS, but I greatly prefer the his late 60's sounding pickups. So much detail and clarity. Tune down half a step, add fuzz and try not to smile. And the bridge pickup just roars. Never had another strat bridge like it. Other little bits and pieces are all CTS pots, switchcraft, Oak Grigsby switch, Fender steel block, Raw Vintage Springs, aged hardware, etc. All in all - my baby came together just as I had visioned in my head. Love when that happens! TonyBony and dansworld like this. Great lookin' guitar! MJT do fantastic work. Man I wish I could find a neck to my specs on ebay or reverb. Great find. That guitar is a real beaut. Mint green pickguards for all solid color strats!!! 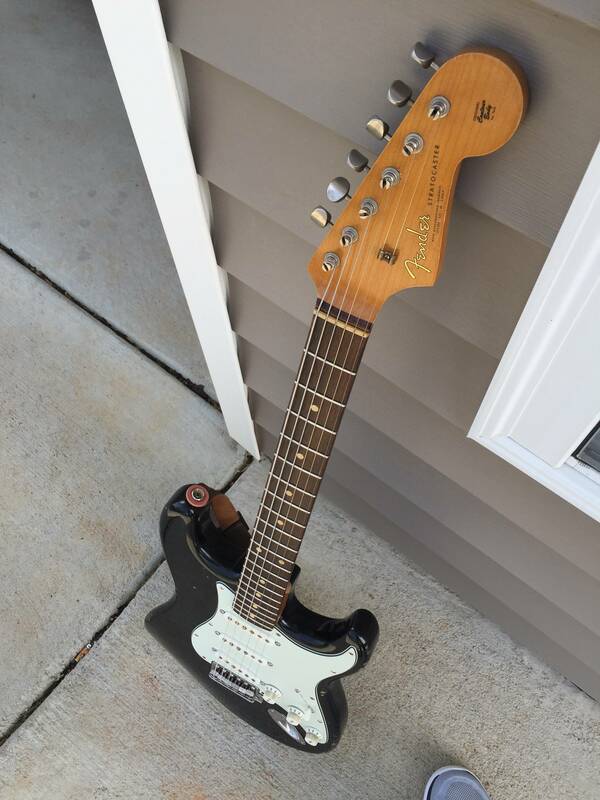 That is my favorite look for a Strat. That 62 or 63 look with a light mint green guard and a worn solid color finish. I have an MJT as well, although mine is swamp ash under a 50's sunburst. But it has a rosewood slab board over maple neck. hard leaving for work today...it was just dying to be played! Finally put together my end all, be all strat. I wanted something simple, utilitarian, and understated. 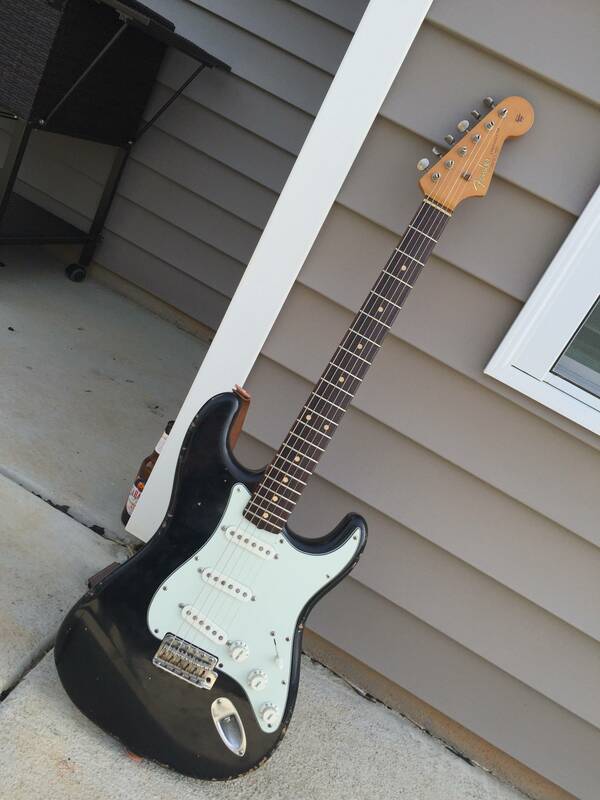 Nothing looks more like a workhorse than a black strat. This thing finally came together from pieces I'd been collecting over the years.